Forum Index > Off-topic Talk > Help with a blade. Posted: Sat 20 Mar, 2010 11:42 am Post subject: Help with a blade. I got this blade from Albion during the rusty sword parts sale. Not sure why I got it, but here it is. So the question is, what do I do with it? Any suggestions? Its 28" long, 1.75" wide at the base, and tapers slightly to 1.62" before coming to a point. 8" tang. Looks to me it was intended for a spatha so you can probably get away with making a spatha - roman or germanic, perharps celtic sword? "The name of the sword sayd the lady is Excalibur,that is as muche to say it cuts stele." 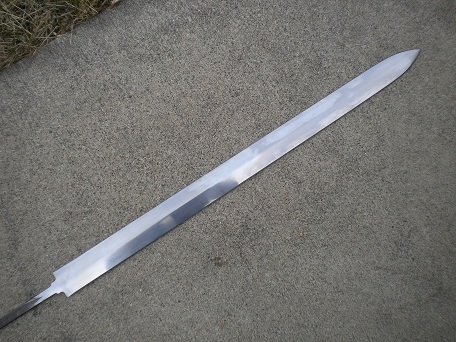 you could also use it for a 15th/16th century type XVIII riding sword.